Our new app has launched. Please download today!!! the App Store or Google Play. 1 – Sign up to team app. You’ll be sent an email to confirm registration. 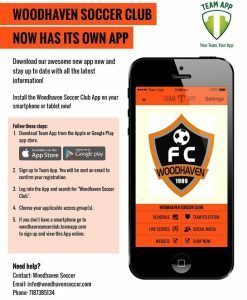 2 – Log in and search for Woodhaven Soccer Club to become a member. It’s 100% free and it will keep you up to date with news, schedules, live scores and much more….